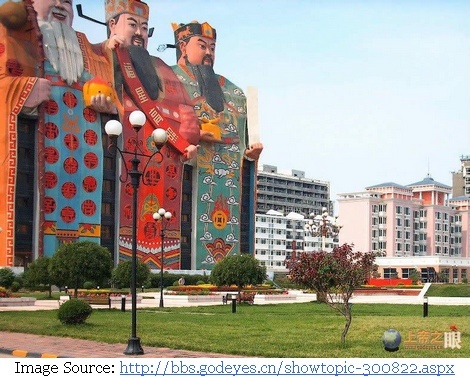 The Guinness World Record for the “biggest image building” is reportedly held by Tianzi Hotel in Zhao Xinzhuang Village, Hebei province, located about 40 kilometres east of Beijing. 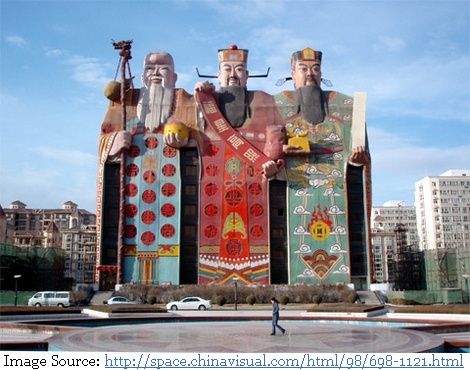 The hotel is shaped like three giant figures depicting Fu Lu Shou - an old Taoist concept of - Good Fortune (Fu), Prosperity (Lu), and Longevity (Shou). Miniature statues of Fu Lu Shou can be found in many Chinese homes. 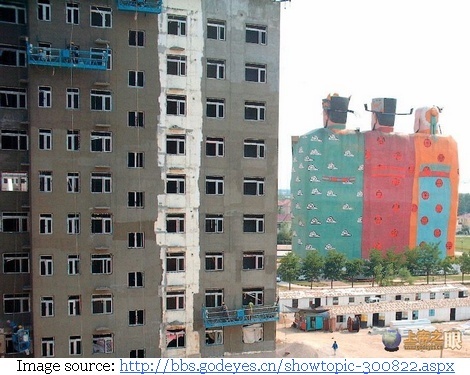 This ten-story (41.6 metres) high hotel also known as Son of Heaven Hotel and The Emperor Hotel was built in 2000-2001. The fruit (peach?) in the hand of white bearded figure on extreme left is actually a suite of the hotel and the eyes are the two windows. Good info. I will add it to my Tours in China. Thanks.